Last October, Don Rosa toured through Germany where he signed at several comic shops and at the Egmont stand at the Frankfurt Book Fair. Check out this wonderful video (with German commentary) by Jano Rohleder. In the video you can see Rosa holding a copy of the new limited edition statue that was exclusively produced by German Comic und Spielzeug in collaboration with the artist. The statue is now for sale and the company is also currently selling the statue on eBay. 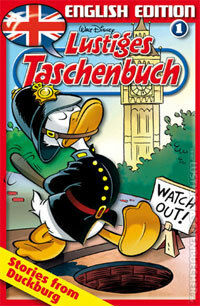 Disney comic writer and artist Don Rosa is doing a tour of Germany this fall. From October 4th through October 16th he will be signing at several comic shops as well as at the Egmont stand at the Frankfurt Book Fair. You can see the full schedule here. 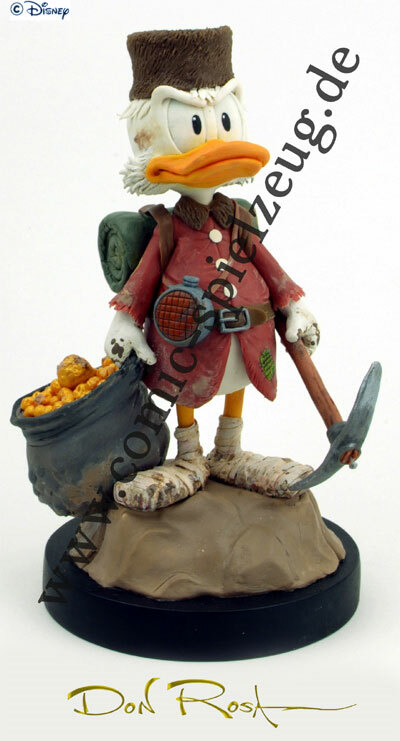 In collaboration with the artist, Comic und Spielzeug has produced a very limited edition, numbered and hand-painted figure of Scrooge McDuck. For this exclusive statue Don Rosa has selected his favorite chapter from this Life and Times of Scrooge McDuck series. Each figure will come with a certificate autographed by Don Rosa. 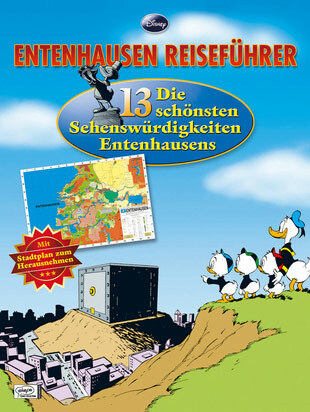 Ehapa Comic Collection in Germany is publishing the Reiseführer Entenhausen mit Stadtplan (“Duckburg Travel Guide with Map”). 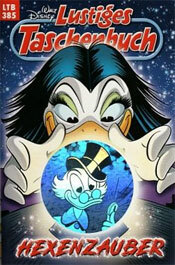 Information in the guide is solely based on stories by Carl Barks, who created Duckburg and many of its inhabitants. The city that we now know as the home of Donald Duck and the famous Money Bin was first mentioned in his story High Wire Daredevils in 1944. The 48-page softcover book will be available in Germany on August 10th for €19,95. It has also been seen on Amazon.de, where international orders are possible. 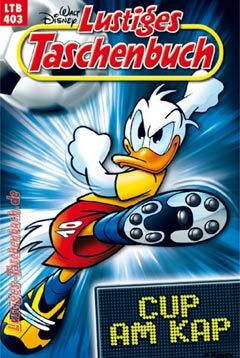 In anticipation of the 2010 World Cup in South Africa, German publisher Ehapa is releasing two special issues of Lustiges Taschenbuch with football-themed stories. The first is Lustiges Taschenbuch Extra released on May 21st (€6.99). The 300-page book contains 12 stories, but most of the pages are filled with a new 221-page saga written by Riccardo Secchi titled 2010 World Cup Cubed, which is currently also running in Italian Topolino. 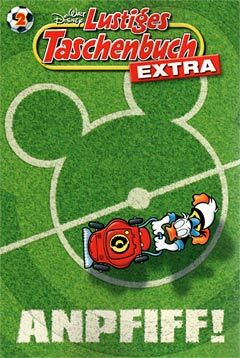 This is actually the second issue of LTB Extra; the first one came out in 2006 in conjunction with the World Cup in that year. Issue 403 of the regular Lustiges Taschenbuch series, in stores on June 1st (€4.99), is also football-themed with 8 Danish and Italian stories by Giorgio Cavazzano, Casty and others. Lustiges Taschenbuch is one of Germany’s most popular series. The 250-page monthly books have a circulation of approximately 240,000 copies and a readership of 418,000 (source). One of the most successful paperbacks in the world comes out with its 400th issue this month. 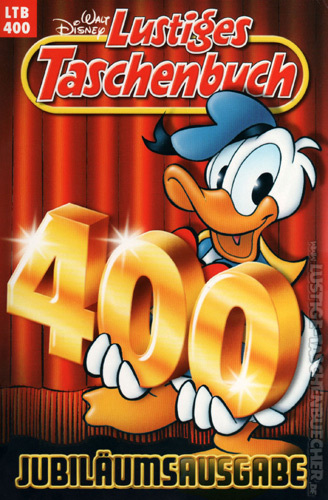 Since Lustiges Taschenbuch was first published in October 1967, Ehapa Verlag in Germany has published over 215 million copies of this popular Disney comic. The 250-page books are published 13 times per year with a print-run of approximately 400,000 copies. 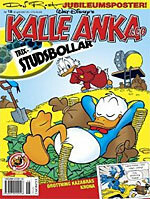 Over the years several spin-off series have been added, including Christmas and Easter specials, a Ducks-only edition, a Mini version and even an English edition. The 400th issue comes out on March 9th. To celebrate this milestone, Ehapa is also releasing a four-volume special edition presenting a selection of some of the best stories by the best artists. The four books will be released one per week in the month of March. 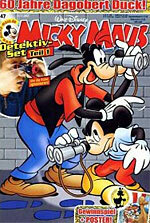 Did you know that in the United States you can subscribe to several European weekly and monthly Disney comics through Amazon.com? 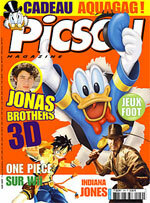 You can get Lustiges Taschenbuch from Germany, Musse Pigg & Co from Sweden or Picsou Magazine from France. Here’s an overview of the Disney periodicals that I found. These titles can be shipped only within the U.S. and the prices listed here include shipping costs. Last month I wrote about the new English-language version of Lustiges Taschenbuch that Ehapa Verlag in Germany plans to launch on July 1st. I had read reports at the time that the 276-page comic would be available outside Germany, but it seems that this is not the case, at least for now. I received an email from someone at the communication department at Ehapa who wrote that, for the time being, the English edition of Lustiges Taschenbuch will not be available to order outside Germany. However, I was not the first one to express interest in getting the books and they are actually thinking about alternative ways to distribute the new title through channels such as Amazon. The main reason for publishing the new English-language Disney comic in Germany is not to enter the international market, but rather to bring local children in contact with the English language at an early age as English becomes ever more important as the world’s lingua franca. Editor-in-chief Peter HÃ¶pfner commented that they are publishing the new English edition of Lustiges Taschenbuch because English is becoming more and more important as it gets taught as early as pre-school and elementary school and secondly, because access to learning another language becomes easier in comic books when words and images are combined. Ehapa Verlag in Germany has released the cover of their new English Disney comics series: Lustiges Taschenbuch English Edition. The first issue will come out on July 1st and will feature stories previously printed in the popular German pocket books. I can’t find any information yet on how to order these books from outside Germany. If you have any more details about this exciting title please let me know or leave a comment below.